. We’ve maintained the same sequence seen in Thomas and Gundry’s edition, however we’ve organized the text in five phases to emphasize transitions in Jesus’ life and ministry which highlight five key principles for ministry. We recommend that you gather with a small group of friends and follow the weekly sequence shown in the Harmony Bible Index. Feel free to print out any page in this website, and use the language translator if needed. Take a look at all our additional resources that will help your make disciples. Register and we’ll send you a “getting started guide” and a free “loose-leaf version” of the Harmony of the Gospels. Phase 1 in the life of Jesus begins before time, includes the incarnation and early years of Christ’s life until the time he was about 30 years old. The thematic emphasis and principle for ministry is to be Incarnational. This phase begins with the baptism of Jesus, and includes his temptation, his first followers, the wedding in Cana of Galilee, his dialog with Nicodemus and the woman at the well. It encompasses the 18-21 months after his baptism. The thematic emphasis and principle for ministry is to be Relational. The ministry emphasis in Phase 3 is to be experiential. In the life of Christ it encompasses about 4-6 months of Jesus ministry beginning with his calling of the first four disciples and ending with a dialog with some prominent Jews after a banquet at Matthew’s home. Ministry in this phase engages disciples in active ministry to and with others in ministry that is: incarnational, relational, and experiential. Younger disciples (those in phase 2) are getting hands on experience in ministry with the guidance of more mature disciples. Each experience builds up the faith, knowledge, and Christian integrity of the one another. Phase four begins with the story of Jesus healing an invalid on the Sabbath and concludes a short 3-5 months thereafter just before appointing the first 12 Apostles. It’s a season in ministry which is very Intentional. Disciples are actively sharing their faith, known to others as being a Christian, engaged in ministry. When discipling others through this phase our priority is to equip them better for the ministry to which they are called. Key lessons include: reliance on the Holy Spirit, discipling others, and the unity of service and heart throughout whole Church. The overall focus of Phase 5 is a missional lifestyle spanning Sections 53-184 covering the last 15 months in the life of Christ until his ascension. We’ve broken into four parts: Phase 5a includes only Section 53-70a beginning with the Appointment of the Twelve Apostles is about one’s Apprenticeship. The overall focus of Phase 5 is a missional lifestyle spanning Sections 53-184 covering the last 15 months in the life of Christ until his ascension. We’ve broken into four parts: Phase 5b hones in on the training of the twelve spanning Sections 70b-101b beginning with the Commissioning of the Twelve. The overall focus of Phase 5 is a missional lifestyle spanning Sections 53-184 covering the last 15 months in the life of Christ until his ascension. We’ve broken into four parts: The focus of Phase 5c is about Multiplying which is seen in Sections 102a-127b beginning with the Commissioning the Seventy. The overall focus of Phase 5 is about having a missional lifestyle. It spans Sections 53-184 covering the last 15 months in the life of Christ until his ascension. We’ve broken into four parts: Phase 5d includes Sections 128a-184 covering the events of Holy Week, the Great Commission, and Jesus’ Ascension. Disciples in this phase have a lifestyle which is renown. The fruit and followers from years of ministry humbles their heart by the knowledge of the grace and truth of God which saved and transformed their life, and however great or small their ministry – they aim to honor Christ alone. The loose-leaf edition is made available only to registered members of Harmony Bible Coop who are serving as small group leaders. All distribution rights have been secured by Greg Troxell, Founder of Harmony Bible Coop. Neither Greg Troxell nor Harmony Bible Coop are under any obligation to continue this service. All rights are reserved, limited, and managed according to our exclusive and unprecedented licensed agreement. History of the Harmony: Early on (c. 150-170) Taitian created what he called the Diatessaron in which he arranged the four accounts into one chronological story. While the Diatessaron was well received throughout Israel, and the middle-east, and into parts of what is now Africa and Europe. Critics of the Diatessaron focus on how it fails to maintain the inspired writing of each of the Gospel writers. Nevertheless, it was used widely in home churches, as well as by bishops and priests. Later Ammonius of Alexandria is credited with the first Harmony which maintained the voice of each Gospel writer but he used the Gospel of Matthew as the basis of the Harmony which undermined any sense of Chronology. In modern times, Edward Robinson (1845) and A.T. Robertson (1923) provided new insights in addition to the work completed by Thomas and Gundry. 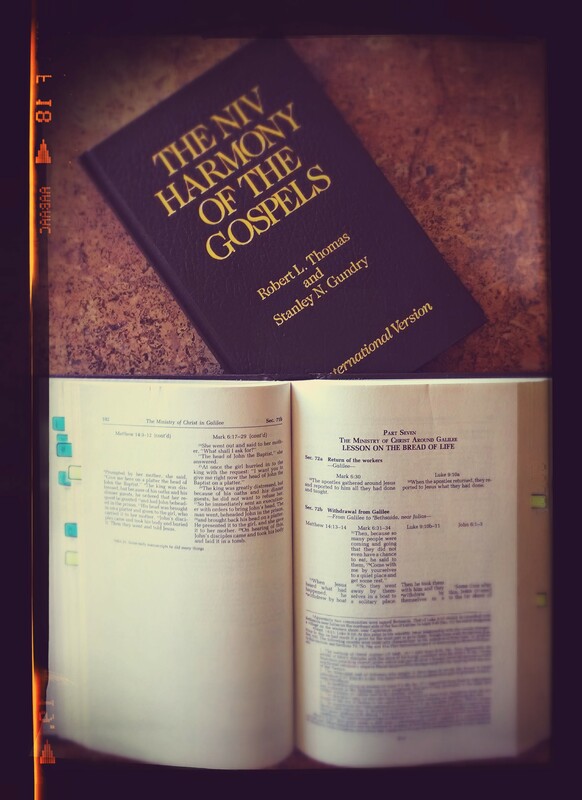 In our online edition we seek to maintain the order and numbering provided by Thomas and Gundry while generating an “open commentary” by members of Harmony Bible Coop who are teachers, scholars and clergy. We wish to publicly thank Michael Johnson, whose ministry helped produced not only the ebible (tutorial video) in partnership with the Digital Bible Society, but also legally secured the free use of the World English Bible.